A beautiful girl stumbles upon a handsome man, lying unconscious in a forest. She needs to get married within the month, he doesn't remember his name or where he comes from. What's a girl to do? Keep him! 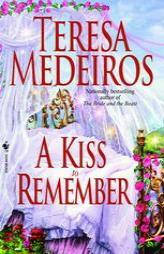 So starts this book by Teresa Medeiros, one of my favorite romance authors. And she is my favorite because she writes a really good story that's infused with humor; the combination of which is irresistible. Laura Fairleigh and her two siblings are the wards of Lady Eleanor Harlow, brought to Arden Manor after a fire kills their parents. Lady Eleanor takes them in in part to assuage the guilt and yearning for her son, Sterling Harlow. Little Sterling was bartered by his father to his great-Uncle, Granville Harlow, the previous Duke of Devonbrooke, in order to become his heir. For years, Lady Eleanor pines for the son she lost. But that son, now the Duke of Devonbrooke, and a returned war hero, disregards her pleading letters. That is until Laura writes with the news of his mother's death. That sarcastic missive brings a furious Sterling to Arden Manor, where he meets with his unfortunate accident in the woods. Upon finding him, she somehow persuades the amnesiac that she is his fiancee and he has just returned, injured, from the Napoleanic wars. Before the newly christened "Nicholas" knows what hit him, the banns are read, and he's married to Laura. And that's just when his memory returns. And the fun starts. Emotions run from desperation to love to redemption, and Sterling finally finds the ability to forgive the past and move on, with Laura's help. The book is a quick read and the "romance" part of this romance novel is well represented if you get my meaning. There's a wonderful side story involving Lady Diana, Sterling's cousin and Thane, Lord Gillingham, who is Sterling's best friend. These two alone warrant their own story. And I can see a sequel in Laura's sister, Lottie, and brother, George. I recommend this book for a quick and enjoyable read. For those of you who come here to read reviews of historical and contemporary romance, you may be initially disappointed with this particular review. I promise you, however, that you will not be disappointed with this book. While Nicholas Sparks, the author of The Notebook, A Walk To Remember and Message In A Bottle, to name just a few, is known for his contemporary and heartfelt writing, nothing he has done compares to this effort. Nothing. Brothers Nicholas and Micah Sparks decide, in the winter of 2003, to take a three week trip around the world; no small feat as they both have to leave their wives (with their blessing) and a combination of 7 children between them in order to do it. The book opens with a brief family history and then describes Nicholas' reticence and Micah's exuberance over the commitment the trip entails, a small insight into their personalities. The book describes this journey in wonderful detail from start to finish. However, what makes it special, and so much more than just a travel log, it how Mr. Sparks weaves the life story of the Sparks family, chapter by chapter, into the trip. This once in a lifetime adventure is meant to bring Micah and Nicholas some time together after a tumultuous and heart-wrenching decade. We get the feeling that by spending that time together, these two brothers make sense of their upbringing, their relationship, the good times and the tragedies, and how they came to be the men they are. Why should we care, you ask? We care for the same reason we love good fiction; because the story and the characters engage and transport us in some way. The same is true of this book, in more ways than one. Nicholas Sparks can weave a story, and while I'm not sure how much direct input Micah had in the actual writing of this book it's interesting to note that while the story is from Nicholas' perspective most of the time, and in his voice all the time, he gave his brother equal credit as author. That basically says it all about the relationship between these two. If you are someone's sibling, son, daughter, father, mother, husband or wife, in fact, if you have any human relationships at all, this book will touch you in some way. I guarantee it. The Romantic is the last book in a series by this author. Previous books, all read by me and thoroughly enjoyed, are The Seducer, The Saint, The Charmer and The Sinner. All of the characters, life long friends and members of the Dueling Society, make an appearance in each of these, so by the time I read The Romantic, their character development was pretty well along. This made for a great conclusion to the series. The Romantic is the story of Julian Hampton, Solicitor, the ton's endless target of romantic speculation, and Penelope Leclere, or as she is known by her married name, the Countess of Glasbury. Penelope has been hiding the past decade. Hiding from the man she married and his interesting way of looking at marital relations and household management. What makes this book so sinister is not the actual description of some of those interests of the Earl, but the sly references to his treatment of his wife and his servants, including sexual abuse and slavery. You get enough of an idea to realize that Pen had no choice but to run. Julian, the Leclere family solicitor, arranged a scheme that would have exposed Glasbury's secrets if he did not let Penelope go. Unfortunately, that blackmail threat lasted only so long, and Penelope is forced to return to England and face down her husband, who holds all the cards, so to speak, in the eyes of English law. What she doesn't anticipate is the secret Julian has been harboring since they were children together. And when she finds out what that secret is, she realizes that she needs to be free of the Earl forever, no matter what it takes. But can Julian continue to protect her? And can he avoid the Earl's anger and determination to get Penelope back and take his revenge? 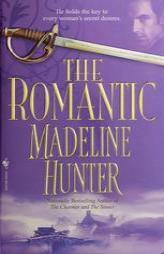 I've read many other Madeline Hunter novels. and they are all very well written with exceptional character development and intriguing plots. This book is no exception. While the book is part of a series, each one can stand alone, as explanations and backstories are given in each. Quick reads, all, they will keep you warm and toasty (if you catch my meaning) as the nights get colder. If you live in the Southern Hemisphere, you may want to turn up the air conditioning. Enjoy!